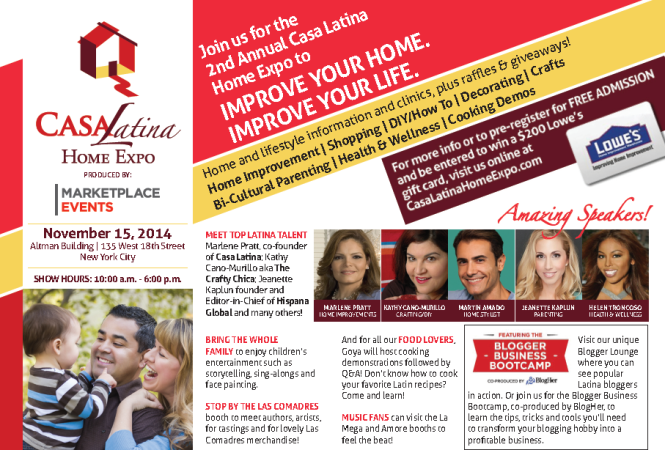 Casa Latina, the premiere bilingual home-and-lifestyle brand will gather again thousands of visitors at their second annual Casa Latina Home Expo in NYC November 15th for a day of expert advice on home buying, DIY/decor/crafts, bi-cultural parenting, home health and home safety. This year’s message is based on Casa Latina’s Improve Your Home, Improve Your Life (MejoraTu Casa, MejoraTu Vida) mission. Nora Diaz Bretherton and Marlene Pratt, founders of Casa Latina, were excited with the response their initiative had last year and expect to duplicate attendance this time. “Last year we were testing the waters and we had great attendance. This year, we want to share our excitement with the Latino community to create an annual tradition with the expo,” Nora said. Under the slogan, “The First Expo Addressing Hispanic Living from a Holistic Home Perspective,” the expo promises a great deal of activities for Latino families, from how-to clinics for easy repairs around the house to cooking classes, and from a Kids’ Zone that promises to entertain the little ones to a BlogHer business boot camp that will provide the opportunity for bloggers to interact with brands. “Contrary to other types of home expos that are more sales-oriented, we want to provide activities and solutions that not only are useful but also are designed with a Latino cultural engagement in mind,” Nora said. Marlene, on the other hand, believes a home can look like a million bucks without actually spending the million bucks. 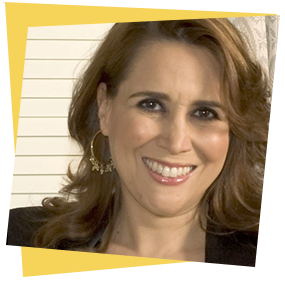 With more than a decade of interior design and architectural experience and a degree in design from the Fashion Institute of Technology, she specializes in designing spaces that are safe, comfortable, and stylish, spaces for everyday life where families can spend time together. 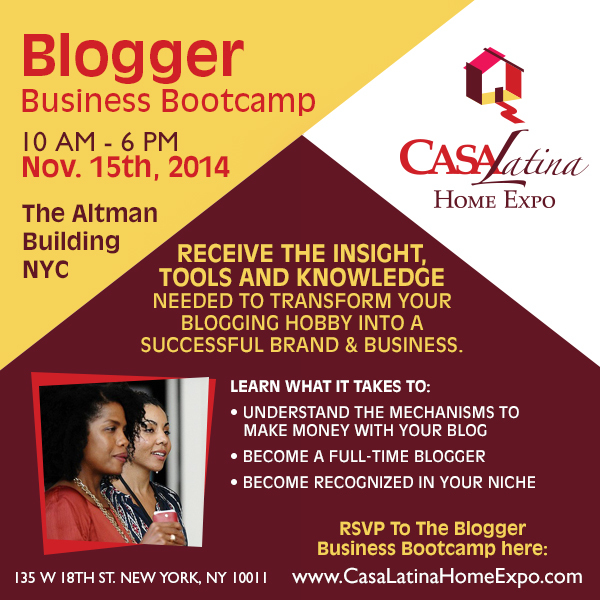 This year, the expo also includes an interactive Blogger Lounge in partnership with BlogHer that will provide an opportunity for bloggers to interact with the event’s talent and brands. Admission is free to the public but organizers are asking attendants to pre-register and participate in opportunities for gift cards and giveaways from great brands. So don’t miss this opportunity to find ideas for your home and your family! For additional information, please visit www.casalatina.com or call Nora Diaz-Breterton at 917.518.3950. SIGN UP NOW AND RECEIVE YOUR OFFICIAL BADGE TO OUR LIBizus COMMUNITY! Makeup in the workplace, can your boss tell you what to wear?